SDS-PAGE (sodium dodecyl sulphate-polyacrylamide gel electrophoresis) is commonly used in the lab for the separation of proteins based on their molecular weight. It’s one of those techniques that is commonly used but not frequently fully understood. So let’s try and fix that. SDS-PAGE separates proteins according to their molecular weight, based on their differential rates of migration through a sieving matrix (a gel) under the influence of an applied electrical field. The movement of any charged species through an electric field is determined by its net charge, its molecular radius and the magnitude of the applied field. But the problem with natively folded proteins is that neither their net charge nor their molecular radius is molecular weight dependent. Instead, their net charge is determined by amino acid composition i.e. the sum of the positive and negative amino acids in the protein and molecular radius by the protein’s tertiary structure. So in their native state, different proteins with the same molecular weight would migrate at different speeds in an electrical field depending on their charge and 3D shape. To separate proteins in an electrical field based on their molecular weight only, we need to destroy the tertiary structure by reducing the protein to a linear molecule, and somehow mask the intrinsic net charge of the protein. That’s where SDS comes in. SDS is a detergent that is present in the SDS-PAGE sample buffer where, along with a bit of boiling, and a reducing agent (normally DTT or B-ME to break down protein-protein disulphide bonds), it disrupts the tertiary structure of proteins. This brings the folded proteins down to linear molecules. SDS also coats the protein with a uniform negative charge, which masks the intrinsic charges on the R-groups. SDS binds fairly uniformly to the linear proteins (around 1.4g SDS/ 1g protein), meaning that the charge of the protein is now approximately proportional to its molecular weight. SDS is also present in the gel to make sure that once the proteins are linearized and their charges masked, they stay that way throughout the run. The dominant factor in determining an SDS-coated protein is it’s molecular radius. SDS-coated proteins have been shown to be linear molecules, 18 Angstroms wide and with length proportional to their molecular weight, so the molecular radius (and hence their mobility in the gel) is determined by the molecular weight of the protein. Since the SDS-coated proteins have the same charge to mass ratio, there will be no differential migration based on charge. In an applied electrical field, the SDS-treated proteins will now move toward the positive anode at different rates depending on their molecular weight. These different mobilities will be exaggerated due to the high-friction environment of a gel matrix. As the name suggests, the gel matrix used for SDS-PAGE is polyacrylamide, which is a good choice because it is chemically inert and, crucially, can easily be made up at a variety concentrations to produce different pore sizes giving a variety of separating conditions that can be changed depending on your needs. You may remember that I previously wrote an article about the mechanism of acrylamide polymerization. To conduct the current from the cathode (negative) to the anode (positive) through the gel, a buffer is obviously needed. Mostly we use the discontinuous Laemmli buffer system. “Discontinuous” simply means that the buffer in the gel and the tank are different. 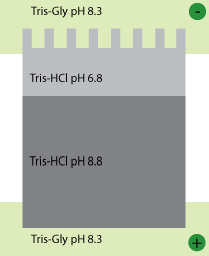 Typically, the system is set up with a stacking gel at pH 6.8, buffered by Tris-HCl, a running gel buffered to pH 8.8 by Tris-HCl and an electrode buffer at pH 8.3. The stacking gel has a low concentration of acrylamide and the running gel a higher concentration capable of retarding the movement of the proteins. So what’s with all of those different pH’s? Well, glycine can exist in three different charge states, positive, neutral or negative, depending on the pH. This is shown in the diagram below. Control of the charge state of the glycine by the different buffers is the key to the whole stacking gel thing. So here’s how the stacking gel works. When the power is turned on, the negatively-charged glycine ions in the pH 8.3 electrode buffer are forced to enter the stacking gel, where the pH is 6.8. In this environment, glycine switches predominantly to the zwitterionic (neutrally charged) state. This loss of charge causes them to move very slowly in the electric field. The Cl- ions (from Tris-HCl) on the other hand, move much more quickly in the electric field and they form an ion front that migrates ahead of the glycine. The separation of Cl- from the Tris counter-ion (which is now moving towards the anode) creates a narrow zone with a steep voltage gradient that pulls the glycine along behind it, resulting in two narrowly separated fronts of migrating ions; the highly mobile Cl- front, followed by the slower, mostly neutral glycine front. All of the proteins in the gel sample have an electrophoretic mobility that is intermediate between the extreme of the mobility of the glycine and Cl-, so when the two fronts sweep through the sample well, the proteins are concentrated into the narrow zone between the Cl- and glycine fronts. This procession carries on until it hits the running gel, where the pH switches to 8.8. At this pH the glycine molecules are mostly negatively charged and can migrate much faster than the proteins. So the glycine front accelerates past the proteins, leaving them in the dust. The result is that the proteins are dumped in a very narrow band at the interface of the stacking and running gels and since the running gel has an increased acrylamide concentration, which slows the the movement of the proteins according to their size, the separation begins. What Was All of That About? If you are still wondering why the stacking gel is needed, think of what would happen if you didn’t use one. Gel wells are around 1cm deep and you generally need to substantially fill them to get enough protein onto the gel. So in the absence of a stacking gel, your sample would sit on top of the running gel, as a band of up to 1cm deep. Rather than being lined up together and hitting the running gel together, this would mean that the proteins in your sample would all enter the running gel at different times, resulting in very smeared bands. So the stacking gel ensures that all of the proteins arrive at the running gel at the same time so proteins of the same molecular weight will migrate as tight bands. Once the proteins are in the running gel, they are separated because higher molecular weight proteins move more slowly through the porous acrylamide gel than lower molecular weight proteins. The size of the pores in the gel can be altered depending on the size of the proteins you want to separate by changing the acrylamide concentration. Typical values are shown below. For a broader separation range, or for proteins that are hard to separate, a gradient gel, which has layers of increasing acrylamide concentration, can be used. I think that’s about it for Laemmli SDS-PAGE. If you have any questions, corrections or anything further to add, please do get involved in the comments section! Originally published on September 18, 2008. Revised and updated on June 20, 2016. Sir if two proteins have same molecular weight it will separate through sds phage . A great place to get know about the underlying principles of everyday laboratory work, especially in the comment section. gel have on how the proteins run? After SDS binding (masking) and boiling, all proteins would be linearised and their charge would be same but their mass should not be same, am I correct? As one of your sentence stated that after SDS binding all proteins charge to mass ratio would be uniform or same. If mass or molecular weight is same after SDS binding how proteins would be separated in the SDS-PAGE? Charge TO mass, not mass. Why are there multiple bonds in the gel photo from SDS PAGE when its only meant to be one? 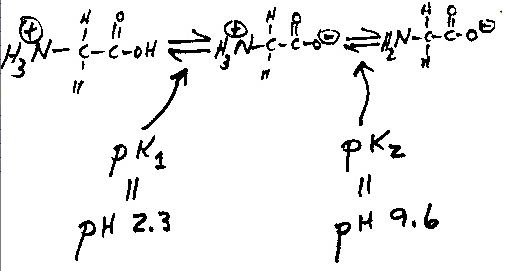 As per the theory, one molecule of SDS is required to bind to two amino acids because this is an equimolar reaction. Then how is 1.4 g of SDS required to bind to 1 gram of protein? According to the binding pattern, we know that 1SDS molecule binds to 2 amino acids right? Our lab recently ran into a problem with all of our gels not showing any high molecular weight proteins but normal amount of protein at low mws (seen using Ponceau staining after transfer). We knew there was a problem prior to transfer, because our protein ladder’s high mw bands started disappearing as the gel was running. This problem was obviously more pronounced in 7.5% gels. Anything above 75kda was completely blank on the blot (marker and protein). We just made up new 0.5M Tris pH 6.8 for the stacking gel, and it looks like the marker is now showing the high mw bands again. The stacking Tris seems to be the cause of the problem. Would you be able to describe why this would occur? Size-exclusion chromatography includes the tertiary shape, and therefore size, whereas the SDS page had reduced the hemoglobin to a monomer, where it exists naturally as a heterotetramer. Thus, in it’s 3-D shape, hemoglobin is four times the size of its monomer, myoglobin, which is what your results support. We don’t have all the different components listed on this page. If you want the protocol, you might want to try getting that from here (http://www.assay-protocol.com/molecular-biology/electrophoresis/denaturing-page). why i don’t use only separating gel? The reason was mentioned in the article. If you were to use only the separating gel, your sample bands would looks like a squarish smeary blob on your gel. This, eventually, defeat the purpose of the gel run since smeary samples–and of course, smeary protein ladder– would cause problem in determining your protein size. Does anyone know why excessive SDS causes a protein to run higher than it normally should run? Multiple people have told me that excessive SDS is the cause (and they are correct that I have used more SDS with a particular sample). But I don’t understand the science behind why extra SDS might cause a protein to run higher. Since SDS linearize the protein molecule and coat the proteins uniformly with a high amount of SDS ( about 1.4 g SDS/ g protein). Due to high amount of SDS bonded a high level of negative charge is observed on the protein. Which is reason for higher run with SDS associated protein. Can you comment on why using fresh vs. fixed tissue is important for SDS-PAGE? There is some research I’ve found that says fixed tissue for westerns is okay, but I have always believed otherwise because of the nature of fixing the tissue cross-links proteins and maintains the secondary/tertiary structure that SDS works in the opposite way to disrupt these links….. I have a small doubt. The pH is maintained on the basis of free H+ ions or the ratio of Protonated and deprotonated salt concentration. When the gels are poured, these ions are small as compared to the sieve or pore size of the gel and are free to move and will diffuse between the gels until equilibrium making the pH same and same thing can happen when they come in contact with the tank buffer. So my question is, can this happen? If so, then is it necessary to make gels of different pH and expect the proposed phenomenon? Thank you so much for the article. I understood the basics clearly, it helped me a lot. I haven’t clearly understood one thing in this, “SDS also coats the protein with a uniform negative charge, which masks the intrinsic charges on the R-groups.” How does SDS masks the charge? Doesn’t it interact with the charges in the protein? For example, since SDS is negatively charged, it may interact with a positive charge in the protein and that part becomes something like neutral. It may also be possible that it may repel with negatively charged amino acids. This was great! However, I have a question. Once we denature the proteins and separate their subunits from each other, are the bands that appear based on the MW of each individual subunit, or are they for the protein all together? Suppose, one has a protein that is a heterodimer, with subunits 20 kDa and 40 kDa, will the band appear on the 60 kDa mark or will one get 2 bands at 20 kDa and 40 kDa respectively? This largely depends on how the heterodimers are bound, but (in general) you’ll end up with two bands that each represent one of the subunits. What if the protein is expected to come off at 100 kDa but comes off at 110 kDa? What could cause it to come off at a higher weight? Someone else I asked said it had to do with the negative charge on the SDS is that true? This refers to protein purity. Essentially there are excess components attached to the protein which are effectively retarding its motion through trough the gel. I’m don’t understand what you mean by purity? shouldn’t every protein be linearized and no longer bonded/associated with anything else after adding SDS and boiling? I have also seen that having more SDS in one lane causes that sample to run higher than it should but I don’t have a logical explanation for why. Two proteins having same molecular weight and charge. will they have same mobility? Proteins having larger size will have more SDS bind to it and thus more negative charge than to the smaller proteins. Then WHY proteins having more move faster to anode (+ve electrode), as they will be more attracted than smaller one`s. I don`t understand why smaller proteins move faster and its on the basis of mass…?????? Bigger proteins do grab more SDS, but they grab a proportional amount to their size. Proteins bind 1.6 g of SDS per 1 g of protein. And, because the SDS unravels the proteins their size is proportional to their mass. So in the end you get the Mass::Charge ratio more or less equal for all the proteins in a gel. Size becomes the big discriminating factor as the proteins are forced to migrate through the matrix. This is a good explanation, but I was wondering after you’ve found the weight of the protein, for example says its 116KDA, what would you be able to tell about its molecular form? I’ve just taught this in a class, and I think Nick’s explanation is way clearer than mine, and DK’s comment is a very welcome addition. My one comment: The article says “The separation of Cl- from the Tris counter-ion (which is now moving towards the anode) creates a narrow zone with a steep voltage gradient that pulls the glycine along….” seems ambiguous or maybe incorrect. The Tris is positively charged, right? And hence will be heading in the other direction, towards the cathode. I too have the same doubt. Can anyone please answer that? what is the fate of cl- in the running gel or resolving gel ,can any one pls explain me…. Very good explanation of something most practitioners who demonstrate and teach don’t even understand themselves. I have a question, why we need SDS in running buffer? I need to know y stacking gel is essential ?. And s that depth of the gel well s makes the reason for it? Y we should not make well in resolving gel ? This is amazing, really helps a lot! thank you so much! You are a good explainer! Great job! Thanks for the information and insights! with resolving gel 10%, How should I control voltage to appropriate for 2 gels? But in a electric field, F(Force)=q(Charge)*E(Applied Electric Field). So, a(acceleration)=F/m(mass)=q*E/m. Plus, d(distance that the charged particle moves under applied electric field under time t)= 1/2*a*t^2, which is proportional to q/m(if E is constant). Thus, if “the SDS-coated proteins have the same charge to mass ratio”, how come there are migration difference between different proteins? What the author is saying here is that the proteins no longer have varying charge to mass ratio. That is, all proteins of the same mass have the same charge. So, charge will not affect the rate of migration through the gel. Also, the SDS binds all proteins in roughly the same proportion to their mass, so all proteins of the same mass will have the same amount of SDS bound. Does that make more sense? i think what you say means like this. different sample protein that have different molecular weight will now have same amount of charge because SDS binds proportional to the mass of those protein. so now the protein molecular radius becomes same now since it has been linearized by SDS while the charge also become same with SDS binding. Now, the only thing that is different among the different sample protein is their molecular weight, so the separation now will only happen depending on their molecular weight. it is like keeping the other two properties of the molecules constant while varying the parameters of DNA molecular weight different. please correct me if i am wrong. You have to consider the pores issue, pores mean friction or bulkiness. The answer lies in your explanation only. But, the variable entity here is the force of resistance which is experienced differently by different proteins due to their varying sizes since, the pore size of the gel matrix is fixed. Thus, ↑ the size, ↑ is the difficulty in moving in the gel, thus, greater is the force of resistance. I want to thank you for the asking this question in this manner, since, only after reading your question did this explanation bumped into my mind. Otherwise, I too had the same doubt in my mind till today. Thanks for posting this. It does help me for understanding the technique. I have a question, why you say ” Since the SDS-coated proteins have the same charge to mass ratio there will be no differential migration based on charge.”? Does the mass affect the migration of charged particle in the gel? the term mass here refers to molecular weight or molecular radius (size)? i dont understand this because your answer state about size. I know that the higher molecular weights the lower the % gel. Will the 28kDa subunit migrate as normal, while the 14 kDa subunit will migrate slower? I’d just like to say that the link for the tutorial is broken. Did anyone of you try out the method described in this paper? I’ve been having some problems with SDS-PAGE lately in that I seem to be getting accumulation of protein at the interface of stacking gel and running gel even after the gel has run its course. Would you know why this is? Also I seem to get a similar flat line above my bottom marker band, so smaller proteins are accumulated in the flat line rather than nicely separated bands. Thanks for such article. It increases the knowledge and gives lot of clarification. Now onwards I will be the frequent user of this website. Wow, just wow. This man deserves a medal! Call me crazy, but I’ve cited a couple of your basics pages in second year university assignments. It’s so hard to find good basic information and when you do you find that 50 year old articles are going for $30!!! I don’t care if they dock marks, I think you’re a wonderful source of decent, comprehensive info to people just starting out and I hope more people make their way here. That was a very interesting description of SDS Page.It sure has improved my understanding of SDS Page. Nice explanation of the SDS-PAGE, I just have to link your post to my work fellows when they have this question. I might be wrong, but in this setup the anode goes for the positive electrode (and cathode for the negative one), as far as the SDS-bound molecules are negatively charged and are called anions and as far as anions go to the anode (the red electrode on the generator outlet). Awesome explanation simple and usefull……. I’m deviating a little from the current topic here. Can you tell me what is the function of ethylene glycol in a Conformation sensitive gel electrophoresis (CSGE)for detection of mutations in DNA. I know it used as a denaturant but what is the exact interactions with DNA that actually help in denaturing it? DK – thanks for providing such an informative comment. Hopefully your points will clear up any questions people are left with at the end of my article. I hadn’t intended to give the impression that the proteins are left without glycine ions in the resolving gel, but that the glycine front speeds up in relation to the protein front after leaving the stacking gel. But, reading it again, I can see that it could be read that way. Thanks for making a good point – again, I hope your comment clears things up for anyone who got the wrong idea. 1. Yes, fast Cl- ions run away, slow glycine- ions that are even further slowed by the fact that large proportion is them is not even ions half the time (pH is chosen so! ), come into the stacking gel. 2. Since electric current = rate of charge movement ==> fast ions in the gel = high conductivity/low resistivity and slow ions in the gel = low conductivity/high resistivity. 3. The rate of electrophoretic movement is a linear function of E, electric field intensity (mobility = some coefficient x E). E is a “voltage gradient”, i.e. E=V/distance. 4. Recall Ohm’s law, V = I x R. In our case, we have a linear circuit so that R is a sum of resistivity of resolving gel (Rr, low) and resistivity of stacking gel (Rs, high): V = I x (Rr Rs). So the overall voltage that comes from the power supply can be said to consist of a sum of two voltages: V= I x Rr I x Rs = Vr Vs (or, in physics parlance, overall voltage “drops” unequally on resolving and stacking gels). The voltage drop on a stacking gel is higher because it has higher resistance (e.g., few charges that move slowly). 5. So, for as long as we have enough buffering in the stacking gel, the situation is this: higher voltage drop on a stacking gel and the voltage drops on a shorter distance. Which means that the driving force of electrophoresis, E (which is, again, voltage drop over distance) is much higher in the stacking gel. 6. The stacking gel is made of very low percentage of acrylamide so that proteins move in it roughly irrespective of their molecular mass. Since in the presence of SDS their charge to mass ration is approximately equal, they all move in the stacking gel about the same – and FAST, comparing to how any of them moves in the the resolving gel. 7. Once the particular protein molecule reaches the resolving gel, its rate of migration slows down dramatically (lower E in the resolving gel and higher percentage of AA in the resolvign gel). So what we get is a situation where all proteins loaded on a gel initially move fast untill they reach resolving gel where they slow down – and this allows protein molecules that were initially behind them (and thus still moving fast) to catch up. In other words, the initial wide band of loaded sample gets concentrated in the narrow band on the boundary between stacking and resolving gels. 8. From there it’s simple: in the higher % AA resolving gel proteins of different mass move with different rate because of the friction against the with a gel, thus allowing the resolution approximately according to their molecular mass. – That is why you should never adjust pH in the running buffer. Doing that adds fast ions which would move into the stacker and make stacking less efficient. – That is why it is not recommended to load samples with high salt content. High salt usually = more fast ions ==> again, screwing up the way stacker works. – That is why gel loading buffer has the same buffer composition as the stacker (pH 6.8 – which isn’t, BTW, great for heating proteins because some proportion of them undergoes acid hydrolysis). So the glycine front accelerates past the proteins, leaving them in the dust. This makes an impression that proteins somehow are left without glycine at all. That’s not true – glycine molecules are continuously coming from the running buffer. What changes with glycines hitting separating gel is that they start running faster, ensuring that the conductivity of the resolving gel remains high – something that, as explained above, is essential for the stacker to work its best. Thank you DK, you made the last remaining doubt very clear, especially, using the physics. I finally understood the principle behind the stacking gel pH. Thank you! Thanks, this is very informative and now I don’t feel like such a moron for doing something that I didn’t really understand.